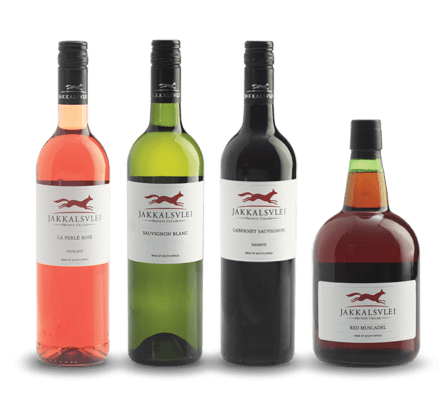 Our classic Jakkalsvlei range caters for all tastes and consists of 8 wines that include red, white, Rosé as well as dessert wines. 2016 was a particularly good awards year as we received 3 Michelangelo Awards ̶ one of which was a Grand d’Or for our 2014 Cabernet Sauvignon. At SA’s oldest wine show, the SA Young Wine Show, we also received a silver medal for our Red Muscadel as well as a gold for our Hanepoot. This exclusive collection is produced in limited quantities and will only be available from our tasting room. Jim Spitsveld, a.k.a. Lord Jackal, is a well-known character in the Herbertsdale area. For years he protected local farmers’ flocks against beasts of prey. Jim grew up with owner Jantjie Jonker’s grandfather, and Jantjie fondly remembers Jim patrolling the veld, rifle over his shoulder, with his faithful hounds by his side. 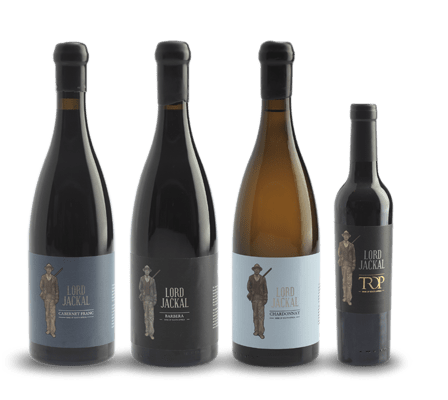 This new range is dedicated to Jim Spitsveld; a man who has probably walked thousands of kilometres in his lifetime while protecting our livestock; a hero in our local community; and one of the friendliest and most modest people we know. 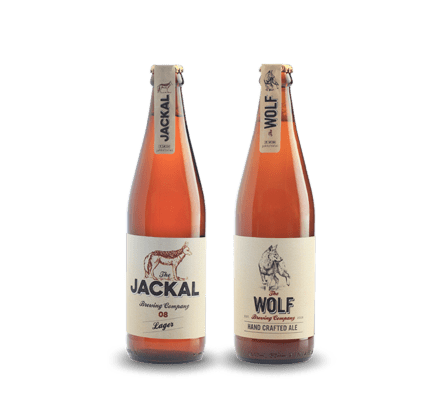 The first of Jakkalsvlei’s Craft Beer range, the Jackal Lager is a natural beer brewed locally according to the Reinheitsgebod method to ensure purity, clarity and excellence. Crisp and dry flavour with some low levels of grainy or malty sweetness. Hop flavour ranges from low to medium levels. Hop bitterness at low medium level. Balance may vary from slightly malty to slightly bitter, but is relatively close to even. Best enjoyed ice cold. Pale golden to deep amber. Moderately large white to off-white head with good retention. Usually a moderate to high hop flavor, often showing a citrusy hop character. Low to moderately high clean malt character supports the hop presentation, and may optionally show small amounts of specialty malt character (bready, toasty, biscuity). The balance is typically towards the late hops and bitterness, but the malt presence can be substantial. Caramel flavors are usually restrained or absent. Error: Error validating access token: Session has expired on Tuesday, 09-Apr-19 03:35:01 PDT. The current time is Monday, 22-Apr-19 10:00:45 PDT.